When you spend your entire work day with your eyes glued to the computer screen, the last thing you want to do is go home and stare at yet another computer screen. This is partially why I haven’t produced a blog post in weeks – I have developed an aversion to computers and sitting. But now I feel pretty good. I had the most relaxing three-day weekend; it ended with a nice five-mile walk along the coast in Half Moon Bay. My lousy legs were just about to collapse when we finally made it back to the car. Since school started, work has been crazy, and I haven’t had many opportunities to move around – therefore, my daily step count is totally pathetic. I haven’t found a good way to remedy that, but I’m very open to advice! Although summer is over for the kiddos at school, my summer is still winding down. I would love to spend these last summer days outdoors, on a blanket, with homemade lunch tucked away in a basket. Then I remember I live in California and summer is not going anywhere. So really I can BBQ and enjoy salads outdoors all year long. 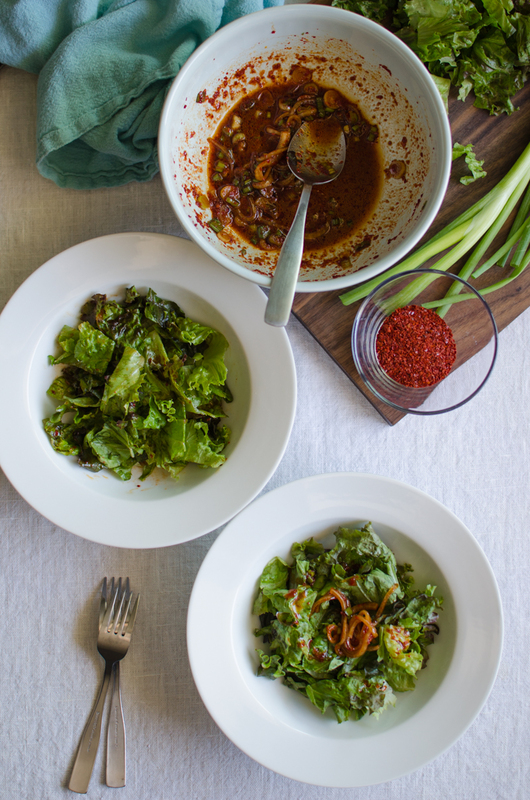 Today I’m sharing a simple recipe for an Asian salad. 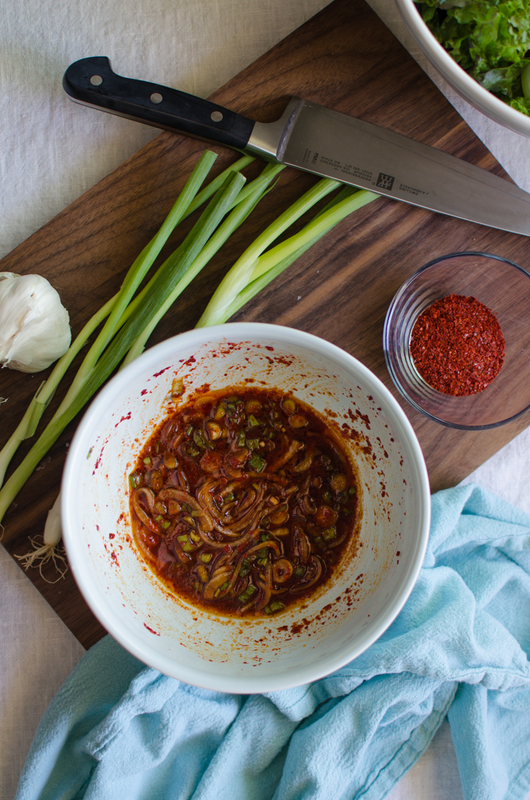 The spicy dressing is made with sesame oil, soy sauce, fish sauce, and red pepper flakes. 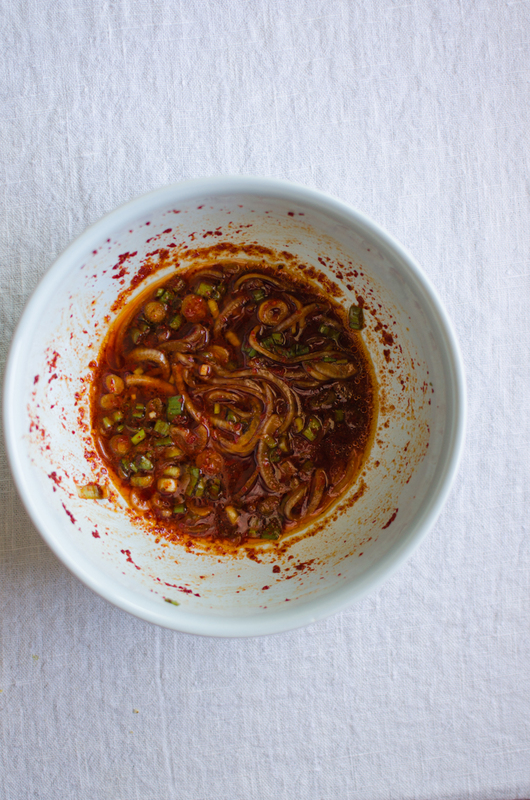 It’s a lovely salad to have with Korean BBQ, and it’s so easy to put together. Mix all the ingredients for the dressing, cover and chill in the fridge for at least one hour. 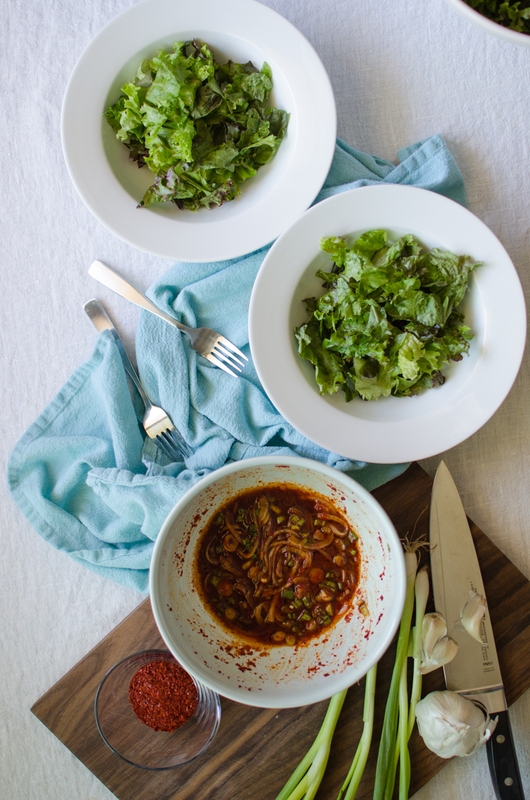 When you're ready to serve, pour the dressing over the lettuce and toss to combine. Serve immediately. This entry was posted in Sides and tagged fish sauces, green onions, Korean, red leaf lettuce, sesame oil, soy sauce, spicy. Yummy! I’ve mostly been purchasing store bought dressings (slowly trying all the flavors available at trader joes). This is going to give my salad a 1000x upgrade. The blog is beautiful, as always.